First off, the tank’s engine and gearbox are built as a single whole, which facilitates its repair and replacement.Uralvagonzavod representative Oleg Zozulya did not elaborate on the engine’s details, saying only that the Armata tank featured the most powerful engine ever built for Russian tanks, which means that the engine packs at least 1,500 horsepower. The tank crew is securely enclosed in a multi-layer armored capsule separated from the ammunition container. The vehicle is fully computerized and remote-controlled via a high-resolution video cameras that directs its movement, track targets and activates the tank’s defense systems. “For the crew, it’s like playing a video game,” said Ilya Demchenko, one of the Armata’s designers. The Armata’s chief designer, Andrei Terlikov, said that the new technologies built into the Armata could make it possible in the future to build a fully robotic vehicle that would operate autonomously on the battlefield. 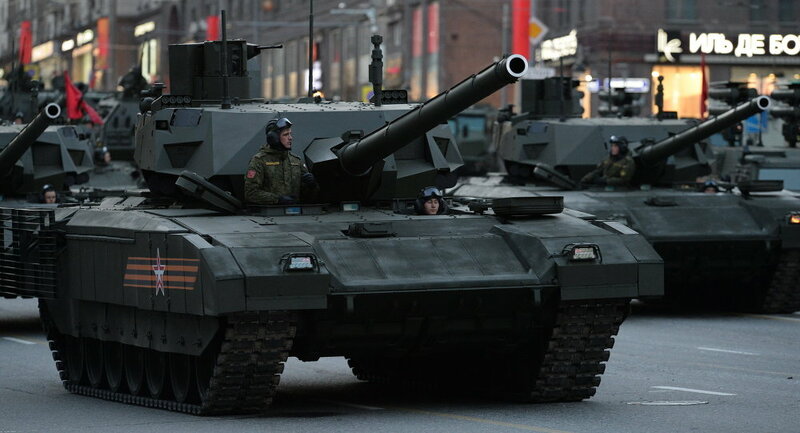 The Armata uses a new type of armor, which designers say is significantly more resistant to enemy fire. On top of that, the vehicle is protected by an improved version of reactive armor, which explodes on impact to stop a projectile from reaching the main layer of armor.The Armata is also equipped with a so-called active protection system, forming an outer perimeter of its defenses. When the system spots an enemy projectile, it fires a round to destroy it or knock it off its path. MOSCOW, September 14. /TASS/. Russia’s Uralvagonzavod, a manufacturer of railway cars and defense-related machines, said on Monday it is ready to look at possible exports of the new-generation tanks, T-14 Armata, to foreign buyers. He said among potential buyer could be countries with big defense budgets, such as China, India, Saudi Arabia, the United Arab Emirates, Qatar. “Sure, there is interest from Europe too,” he noted. The Armata is a commonized heavy platform that has served as a basis for a tank and an IFV. An armored recovery vehicle is being derived from it too. The new tank is furnished with an unmanned turret, all-digital controls and an isolated armored crew compartment. Its main armament is a 125-mm gun, but the introduction of a 152-mm gun sometime in the future is a possibility. Russia’s next generation heavy military tracked vehicle platform, better known as the Armata, has every chance of winning one-on-one battle against the best tank Germany has to offer, the Leopard 2A7, according to the National Interest. Although both war machines are hailed as exceptional pieces of military hardware, “Berlin’s tanks in a theoretical match-up would face a problem,” NI’s defense analyst Dave Majumdar noted. 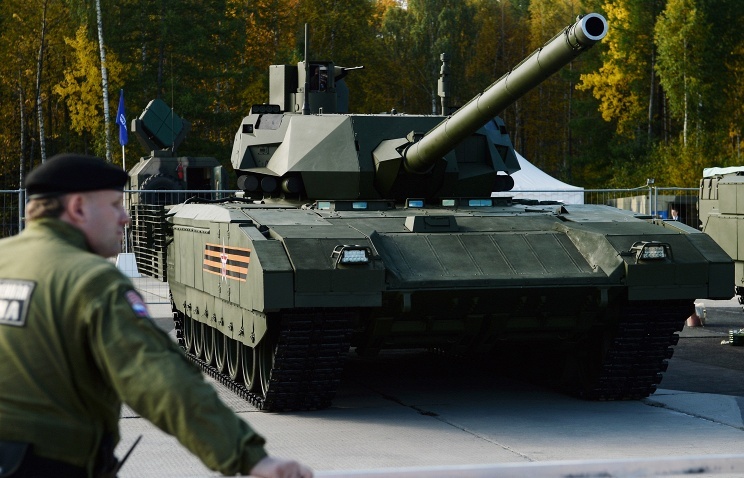 “While the Leopard is probably overall more than a match for the Armata – it doesn’t have the right ammunition to defeat the T-14,” he explained. According to the expert, the Leopard’s key disadvantage stems from the fact that it uses tungsten instead of depleted uranium for tank rounds. The choice of material affects performance. “Because of the limitations of tungsten ammunition, the Bundeswehr has some doubts as to the ability of its penetrator rounds to punch through the armor of the latest Russian tanks. Specifically, there might be instances where German ammunition might not have enough kinetic energy to ensure a kill against the T-80, T-90 and obviously the Armata,” Majumdar pointed out. Using US-made ammunition could have been an option but it is said to be incompatible with the Leopard’s improved L55 tank gun.The Leopard might well be one of the world’s best tanks “when it comes to blending firepower, protection and maneuverability,” as defense analyst Thomas Newdick put it, but the future seems to belong to the Armata platform at the moment. Keep in mind, that Russia’s cutting edge piece of military equipment will not remain static. For instance, its designers say, that the Aramata could well become the first unmanned tank in the world. NIZHNY TAGIL, September 10. /TASS/. Protection offered by Russia’s advanced Armata tank is way ahead of all foreign rivals, Mikhail Alexeyev, research director and chief designer of the Steel Research Institute, told TASS on Thursday. Armata also uses systems to disrupt guidance of incoming projectiles and active protection systems to detect and destroy closing munitions before they strike the main armour, Alexeyev told reporters. Steel Research Institute is Russia’s major expert institution in army hardware protection materials and structures. It develops explosive reactive armour, electromagnetic and radiation protection and systems of “reduced observability” to protect from precision-guided weapons. Institute specialists are developing protection technology for virtually all future combat systems such as the T-14 Armata, Kurganets-25, Boomerang, Platform, Typhoon, Ural-VV, Tornado and Dragoon. A leading Russian electronics company is ready to adapt a number of their combat helicopter gear for use on the latest types of armored vehicles, including the state-of-the-art Armata tank. “We offer a slew of new electronic gear, from fire control systems to self-sustained navigation gear based on systems of inertial navigation and multifunctional indicators,” Vladimir Mikheyev, a senior executive at the Radioelectronic Technologies Concern (KRET), told RIA Novosti news agency on Tuesday.“We at KRET are developing helicopter weapons control systems, and if we can control helicopter cannons and missiles, we can just as well do this on a tank,” he added. Vladimir Mikheyev said that some Russian armored vehicles already featured multifunctional indicators designed by KRET. “A tanker’s seat now looks a lot like that of a helicopter pilot with the very same shock-proof multifunctional indicators and other electronic gear using technology, which suits the demands of ground combat vehicles,” he noted. Russia plans a 70 percent upgrade of its arsenals by 2020 and next year will see the mass purchase of new weapons systems such as the Armata tanks, Bumerang armored vehicle, Kurganets-25 armored personnel carrier and Taifun armored cars. 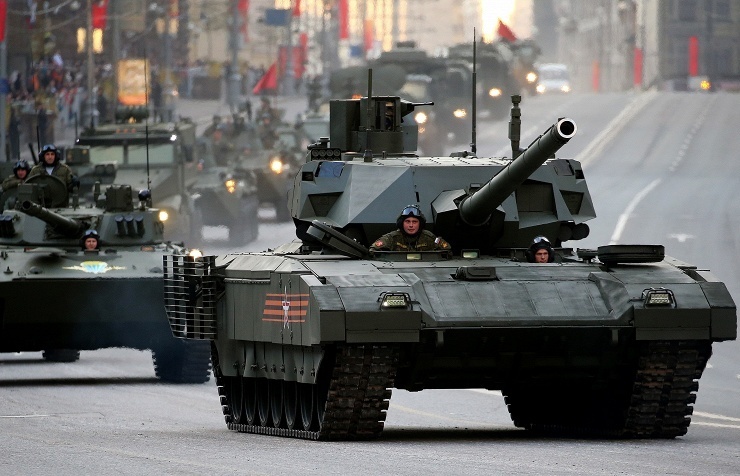 With the introduction of Russia’s new Armata main battle tank, modern warfare tactics will change forever, as everyone will have to adjust to the Russian armored monster on the battlefield, military expert Vladimir Evseev said. When the first Armata tanks roll out of factories, Russia will become a trend setter in modern tank warfare. “In fact, Russia here is a trendsetter. If the Armata tank recommends itself, then the world will have to think about it. Major manufacturers of armored vehicles have to build counterparts,” Evseev told Radio Sputnik. The new tank is based on the new Armata Universal Combat Platform, on which not only tanks are built, but also infantry fighting vehicles, self-propelled artilleries, armored recovery vehicles and armored personnel carriers will be based. The new Armata platform is therefore meant to replace older Russian MBTs and APCs that are currently used by the Russian military. Moreover, the Armata platform, on which the new T-14 tank is constructed, has huge potential for future modernization. At this day and age, the Armata is by far the most advanced tank platform in the world, Sienko added.The Russian Defense Ministry showed its new tank during the Victory Day military parade in Moscow on May 9. The tank is operated by a crew of three, sitting in an armored capsule at the front. The tank’s main armament includes a 7.62 mm remote-control machine gun and a 125-mm smoothbore cannon. As part of its massive rearmament program Russia is likely to focus major efforts on developing unmanned military systems, which could become its secret weapon, Blake Franko wrote in the National Interest. “Conceptually, the idea of focusing on unmanned systems in Russia is not new. There has been significant development of these robotized systems in recent years,” the expert noted. Russia’s new Armata combat vehicle is rumored to be on the way to become the world’s fully automated tank. And while this impressive piece of military hardware is getting there, the Russian Army is already operating robotic systems.One of them, dubbed Platform-M, was recently showcased in Crimea. The system is designed to carry out reconnaissance, patrol, cargo-carrying and combat missions. Trial tests of another robotic platform, capable of transforming into an array of useful units, ranging from a route clearance vehicle to electronic warfare system, are expected to start in late 2015. “The drive for drones is rooted in Russia’s attempt to get past the Soviet model for a military, which famously coined the idea that quantity is its own quality,” Franko claimed. The expert also noted that the United States and China are developing unmanned military systems, which could result in a robotic arms race. “Skynet may yet be highly unlikely, but the ambiguity added to the already complicated modern battlefield will be enormous,” Franko stated.